‘Imaan ka naam hai Musalman’ but Mamata Banerjee also had this to say about Hindus, Christians and Sikhs. 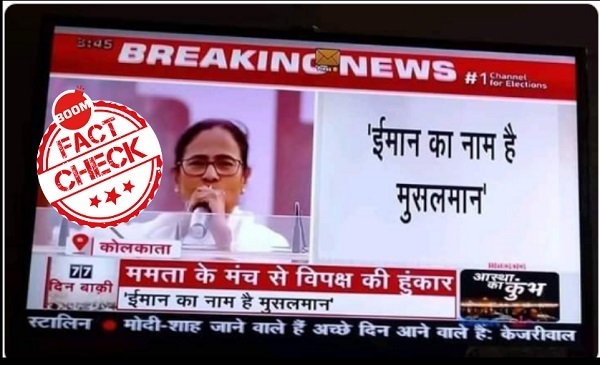 A screenshot showing Mamata Banerjee with the words ‘Imaan ka naam hai Musalman’ is being shared online with misleading context that the West Bengal chief minister only spoke about Muslims during her opposition unity rally over the weekend. The screenshot is from the LIVE broadcast of the United India Rally, held at the Brigade Parade grounds (Kolkata) on January 19, 2019. The image is now viral on WhatsApp, Facebook and Twitter with the narrative of ‘minority appeasement’ by the chief minister. Twitter user Gaurav Pradhan , who is followed by Prime Minister Narendra Modi, also shared the image. BOOM has busted Pradhan several times in the past for sharing misinformation. However, Banerjee also mentioned people of other faiths and not just Muslims. The image was also debunked by India Today. The line has been carefully used from Banerjee’s speech from the Brigade ground rally. Below is the LIVE video that Banerjee has shared on her official Facebook page. The screen grab is originally from NDTV Khabar’s live telecast of the India United Rally. Below is the link of the coverage. You can stream to 20.52 for the moment when Mamata Banerjee’s reference to the religions has been made into a text graphic.